Collaboratively directed by twelve people, Stages is the Meerkat Media Collective’s first feature-length film. Since 2005, Meerkat Media has also produced over twenty short films, which have been featured in film festivals and screenings nationally and internationally. Through skill sharing and collective authorship, Meerkat Media strives to create works with a non-hierarchical and inclusive creative process. 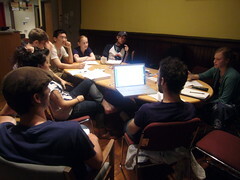 The collective produced Stages collaboratively, shooting, editing and reviewing footage using an adapted consensus process. Collective members consensed on every trailer and in-progress cut of the film, and decided collectively how to proceed with each step of the project. Feedback was periodically solicited from the educators facilitating the Evolve Theater Project, and later, from the participants themselves. The Meerkats are also currently in development on a feature documentary called “Brasslands” about the worlds biggest trumpet festival in Serbia and a feature narrative drama titled, “A Little Death.” They have also recently premiered “Brooklyn Boondoggle,” a short documentary about community response to the controversial Atlantic Yards development project. Long-distance collective members have participated in Meerkat projects from as far away as Boston, Austin and San Francisco, united by the desire for a kind of consensus art that inspires, encourages, and motivates others to tell their own stories. Visit their website to learn more or contact them directly.